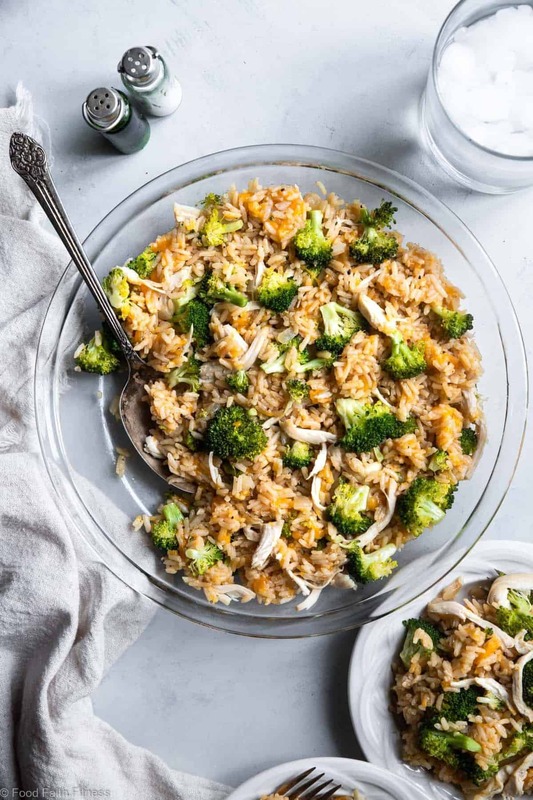 Just wanted to let you know that this cheesy Instant Pot chicken and rice casserole is sponsored by my friends over at World Vision! 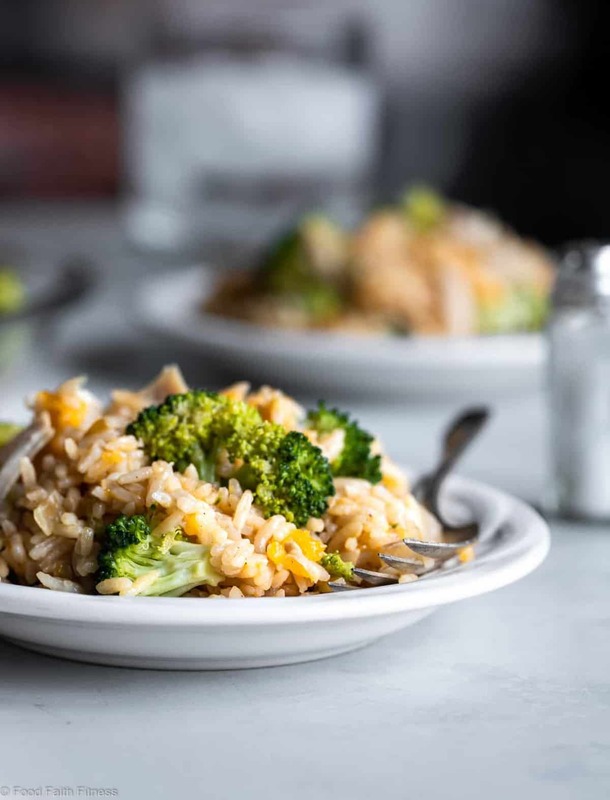 This Instant Pot chicken casserole with broccoli is an easy, weeknight dinner that almost makes itself! Kids and adults will love it! This post comes with a little preface. Just like the paleo carrot cake where I told you its an impromptu gluten free carrot cake month, it’s also an impromptu month of INSTANT POT RECIPES. Liiiiike, I might have an instant pot breakfast casserole , on top of this Instant Pot casserole. But, like, when the Instant Pot makes cooking all kinds of food so fast and easy? WHY NOT UTILIZE IT EVERY DAY ALL DAY. I’ll stop yelling at you and calm down for a second. I’m one of those people that can eat a casserole any time of the year. Regardless of if it’s negative eleventy billion degrees outside or if it’s 110 degrees, casseroles are in style for me. There’s something so comforting about a mish mash of yummy ingredients that just makes my heart burst and my tummy so satisfied. 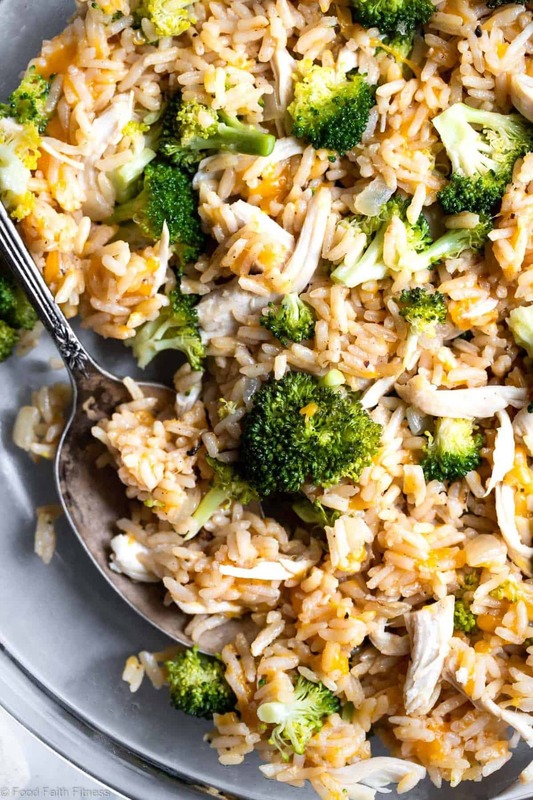 Especially when that mish mash involves tender-crisp bursts of bright-green broccoli, a THICK swirl of ooey-gooey, melty cheese and wholesome, chewy rice with tender, juicy chicken AND the creamy, rich taste of BUTTER in every bite. 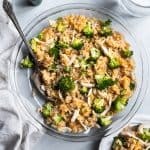 Whether it’s broccoli cheese soup, a cheesy zucchini casserole with broccoli or this Instant pot casserole recipe, the combination of broccoli and cheese is always going to be a solid dinner plan. Vegetables are tasty on their own, but when you cover them in cheese and mix them with carbs? THAT is a dinner that is e’rybodies jam. You know what though? We’re lucky that we have access to nice clean water to make a pressure cooker casserole for our families for dinner, which is why I’m partnering again with World Vision (you remember the goat cheese cheesecake yes?) to build awareness around their Global 6k for water! 6 Kilometers is the average distance people in the developing world walk for water, and that water is usually contaminated with life-threatening diseases! On Saturday, May 4 thousands of people from all around the globe will participate in the Global 6K, and will walk or run 6 kilometers to bring clean water to communities in need. The registration fee is only $50, and it provides clean water to one person through World Visions water projects. So, every step YOU take is one that person won’t have to! Each World Vision water project is sustainable as it gives local people training in maintenance and repair and is part of a community-based strategy that addresses a broad range of critical needs. They reach one new person every 10 SECONDS and three more schools each day to provide clean water! They are also Christ-centered, and these projects are carried out with the love of Jesus, which is one the many things I love about the organization! I made this rice casserole with nice, clean water and then dirty water so you can see the difference. 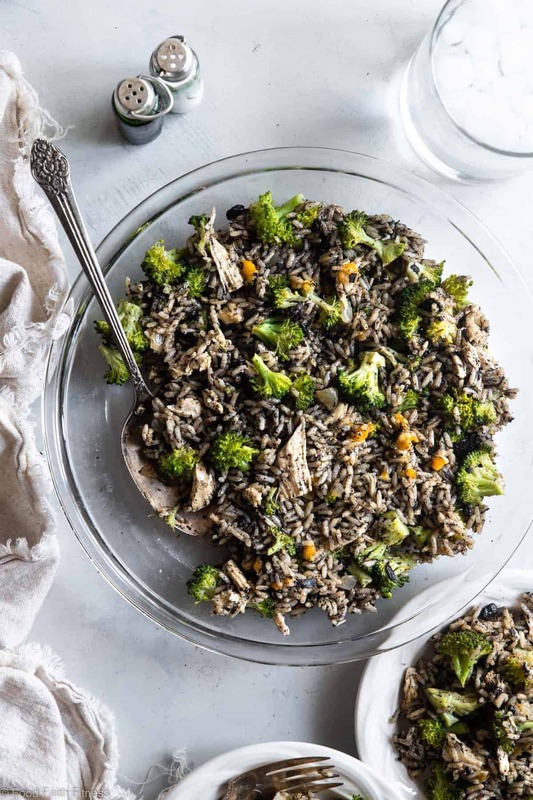 That ain’t no wild rice my friends, that’s just dirty rice, dirty chicken and dirty cheese and veggies. We don’t realize the privilege we have that we can drink clean water right from our taps! 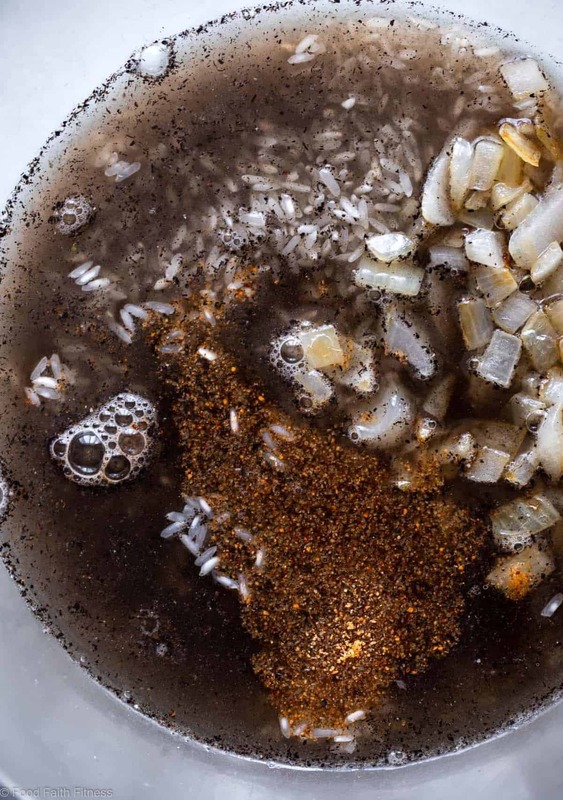 If someone from the developing country had the kitchen gadgets to make this Instant Pot chicken and rice casserole, it would look a LOT like the dirty version that we would not want to eat and would never serve our families. If you want to sign up for the Global 6K you can do so HERE, and you can use the code “foodfaithfit6k” to get $10 off the registration fee! 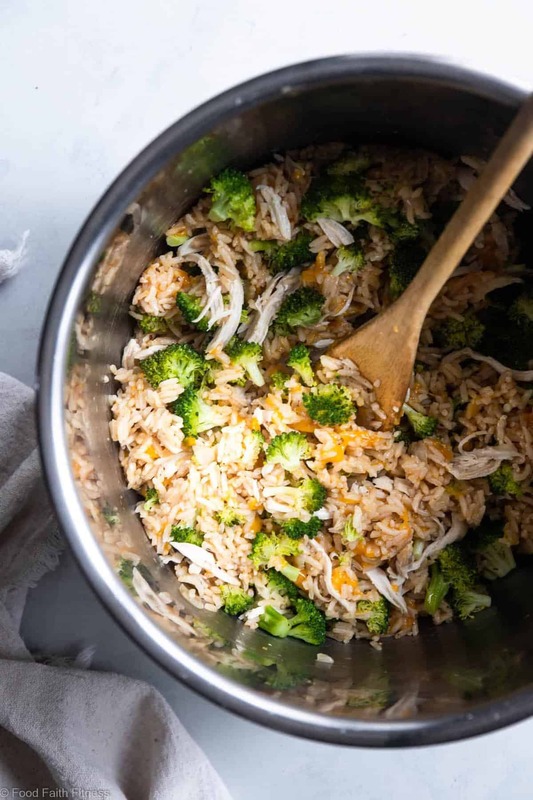 Gluten free cheesy Instant Pot chicken and rice casserole with broccoli is an easy, weeknight dinner that almost makes itself! Kids and adults will love it! Melt 1 Tbsp of the butter in your Instant Pot on sautee mode. Once melted, add in the onion and cook until it just begins to soften, about 2-3 minutes. Then, add in the garlic and cook an additional minute or two until they begin to brown. Place the rice in a fine sieve and wash with water until the water runs clear. Add it into the Instant Pot along with the water, salt, onion powder and pepper, stirring to combine. 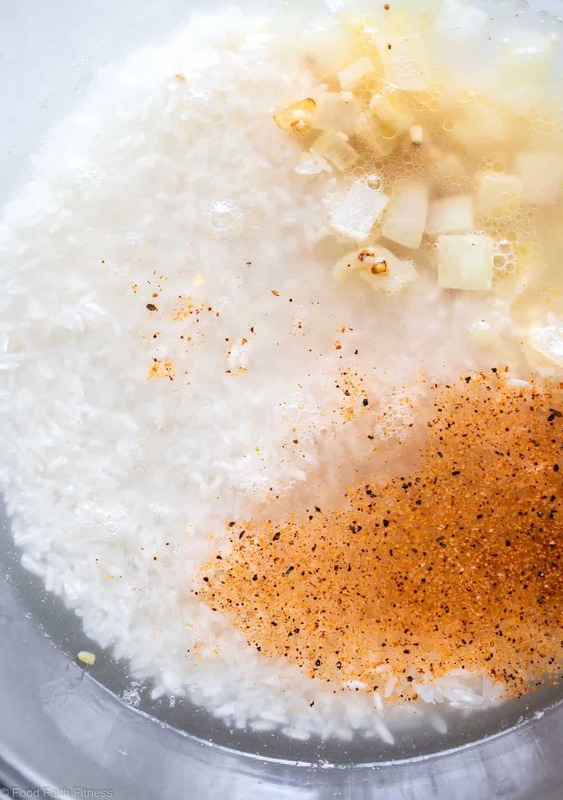 Once the steam has released naturally, open the Instant Pot and fluff the rice with a fork, stirring in the last Tbsp of butter. Stir in the broccoli, cover and let sit 15-20 minutes until the broccoli is tender. Stir in the chicken and cheese until melty and combined. THIS POST IS SPONSORED BY MY FRIENDS AT WORLD VISION THANK YOU FOR ALLOWING ME TO CONTINUE CREATING GREAT CONTENT FOR YOU BY SUPPORTING PARTNERSHIPS WITH SUPER-FAB BRANDS THAT FOOD FAITH FITNESS LOVES TO WORK WITH! AS ALWAYS, OPINIONS REMAIN 100% MY OWN! If you want to learn more about clean water click HERE. I love making a meal like this for busy weeknights. Not much prep involved so I can be helping the kids with homework while our meal is cooking. Thanks for sharing a great weeknight staple. Another WIN for the pressure cooker world of recipes! YUMMMO this Instant Pot recipe has delicious written all over it! Great one pot meal, and kudos to you for partnering with World Vision. It’s a great cause and a resource that we often take for granted. Been loving my instant pot lately, I’m so excited to have found this recipe! It’s so easy and so delicious! WOW! This is looks incredibly easy and delish! I just happen to have these ingredients so am going to make it tonight for dinner – – if I can wait that long! Hey this looks awesome!! But I don’t have a pressure cooker! Is there some way I can do it in a slow cooker or oven?? You can try it in the oven, but I can’t tell you how long it will take as recipes are only tested as written. 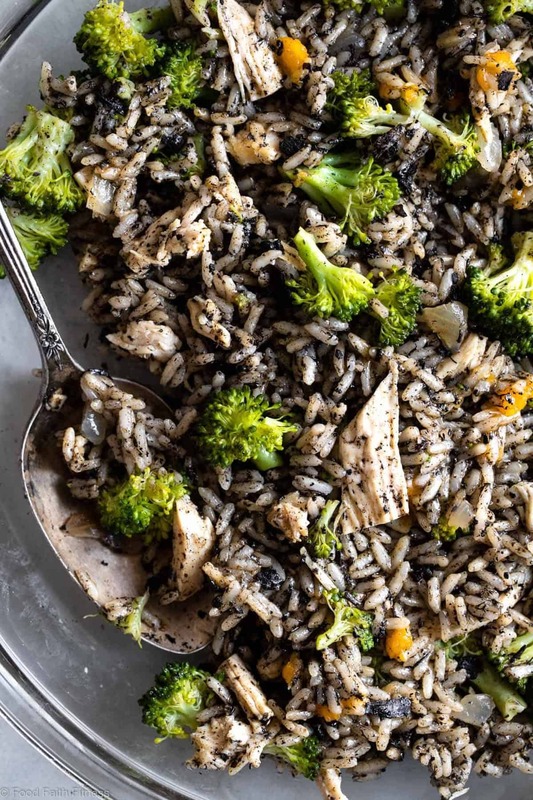 You might want to do some googling and see how other oven rice casseroles are cooked and try that! I hope that helps!